Ford Motor is teaming with drone maker DJI to focus on drone-to-vehicle communications that can be used in emergency zones that are not accessible to ground vehicles, while also exploring technology that will link vehicles with Amazon Echo and smart home platform Wink. 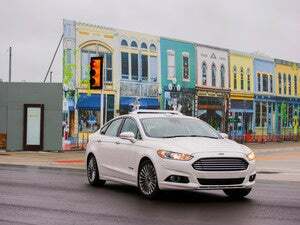 The automaker is also tripling to 30 this year its fleet of Fusion Hybrid autonomous research vehicles, using new low-cost Lidar sensors from Velodyne in California. The car will have fewer sensors - two from the usual four- as a result of the Velodyne design. Ford is one of many car makers that are aiming to automate various functions of vehicles and integrating them with smartphones and smart appliances. On Monday, the company said Apple CarPlay and Google's Android Auto would be supported on its Sync in-vehicle connectivity system. Apart from wanting to give users of Apple and Android phones the ability to use in their cars the smartphone technology they’re comfortable with, Ford is looking at expanding its own in-house technology to support more features. The company, for example, also announced Monday new Sync AppLink applications that use voice-activated technology for a hands-free bridge between the user and smartphone applications. Ford has launched a developer challenge with DJI and the United Nations Development Program to get developers to create software that would allow its F-150 pickup truck and a drone to communicate in real time, using Sync AppLink or open source OpenXC technology for custom applications and pluggable modules. The vehicle-to-drone communications is expected to be useful, for example, for United Nations first responders in earthquakes or tsunamis to access quickly areas that cannot be reached from the ground. Ford said Tuesday it is also looking at linking smart devices like Amazon Echo and Wink to its vehicles in a way that would allow consumers to control lights, thermostats and their security systems from their cars. It announced last year that its cars would use its Sync Connect technology to let users remotely lock and unlock cars, check fuel levels, and locate and start a vehicle using a smartphone. The car maker now expects to use Amazon Echo paired with the Alexa cloud-based voice service, to let users access their vehicles from inside their homes. Ford is also seeing its technologies being evaluated by car rivals including Toyota Motor, which on Monday said it would adopt SmartDeviceLink, the open-source software on which Sync Applink is built.